The Warlord Chinese aren’t even newly painted – I just re-based them (again). I was basing and priming and gooping a bunch of other stuff (the toys I picked up at the Sentry Box, the Mounties and the figures for the Canadian-Siberian Expeditionary Force…) so I thought I’d get started on a long overdue re-basing project. They were originally individually based on ¾” washers (which I originally used for all the 25/28mm figures I was basing individually for Contemptible Little Armies and such). 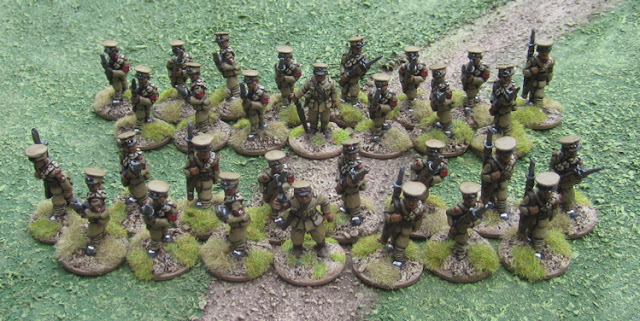 Later I rebased all my Great War/Russian Civil War era figures onto multi-figure bases for use with a DBA/HOTT variant. Still later I rebased them all onto 1” washers… well… ALMOST all. The Warlord Chinese Infantry are the last of those figures still on multi-figure bases. I’ve had no need for them for some time, but I’m hoping with this renewed interest in the era I’ll get to using them again. Mounties with pistols from Tiger Miniatures. 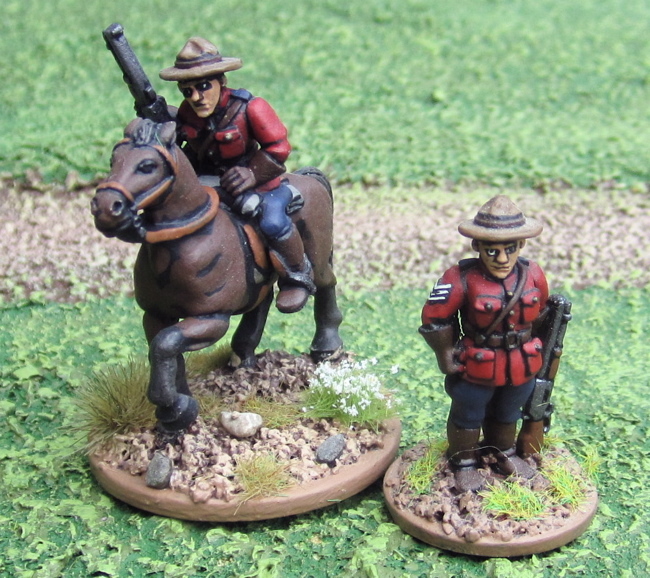 Mounties with Rifles from Tiger Miniatures. I had considered doing them in khaki uniforms to use as the RNWMP detachments that I’m pretty sure accompanied the Canadian Expeditionary Force overseas, but I’m not sure that it’d be correct – I’m not sure it was as simple as wearing a khaki version of their regular uniform – they may have just been in a regular cavalry uniform… I did also pick up a few Mounties in cold weather gear – those ones I will probably do in khaki to go along with my Canadian-Siberian Expeditionary force! I wanted to post a comparison picture of these guys with the Pulp Figures ”Sgt. Prestown of the Yukon” which I previously painted… but I can’t seem to find him!? Two units of Warlord Chinese. A Broken Legions game report…? Update on the Regina Trench! terrain…? Possibly an update on the Vimy plans…? modeled, moulded, cast and painted by myself...........they are beauties. Very well done!! Thanks Ray! Up close they're not so pretty... but en masse no one notices these things. What a wonderful job, they look great! Well the mounties are certainly fun! Lovely uniform and I like the Chinese en masse, I'd say you've done really well at sticking to your WW1 project surely you deserve a minor detour? (Not that that stopped me from playing Broken Legions today - stay tuned for game report)!